This is a fantastic guest post by Frankie M. Thompson of the As the Bird Flies blog, a published author of Shy Feet: Short Stories Inspired by Travel . You can read a free sample on Goodreads or download one of the stories, See the Amalfi Coast for free from Frankie’s blog. Last week I shared how writing a book was one of my dreams, and now that the book is finished, published and “out there”, I’ve had time to reflect on it all. It’s funny that we call these goals of ours “dreams”, even though chasing our dreams is far from a “dream-like” experience. Quite the opposite, chasing dreams is often a long and enduring journey of really hard work. For me, writing a book very much involved the obligatory blood, sweat, tears and fears that often put people off. But what you don’t often hear about is the joy that greets you and keeps you going along the way. And there really were many wonderful moments, like reaching that milestone of finishing the first draft and also holding the paperback version of my book in my hand for the first time. If you have ever thought of writing a book yourself, I can’t say that the fear and hard work is going to disappear, because it won’t, but these aren’t reasons to not do it if it is indeed “your dream”. Here are some of my top tips for writing a book based on what I learned from writing my first book. 1. Set and honor deadlines (like NaNoWriMo) or track your word counts with WriteChain app for iPhone, this tracking tool for your blog or Scrivener, arguably the best writing platform out there. You really don’t need to do a lot every day; even if you write only 200 words a day, that’s a novel of over 70,000 words in a year. 2. Keep reading while you write. Whether you’re writing fiction or non-fiction, the joy of reading is a quality you want to try and capture in your own work, so keep that joy close as you work on your book. 4. Source a great group of beta readers. You will never be able to approach your book as a reader, so reach out to a varied group of beta readers who you can rely on to read your work and offer honest feedback. 5. Outsource editing and proofreading. Your eyes will never be able to see all the typos and spelling mistakes that need to be corrected so see this as an investment – and yes, I would even do this if you’re pitching to an agent, a polished product goes a long, long way. 6. Live life while you write. It’s true that some authors hide themselves away from the world while they write their books. I could have done this but seeing as I was still traveling and still running my own business, I was determined to maintain as much of a life-work balance as possible. I started waking earlier, doing yoga stretches in the morning and running a mile a day because exercise helps my energy levels and my partner installed a strict curfew on when we stopped work in the evenings so we could spend time together. And I took days off to explore each new place we were in. I must be the only writer who recommends days off from writing, but I do. After all, without life experience, what would we write about? Buy Shy Feet: Short Stories Inspired by Travel from Amazon or Kobo. Frankie is a writer and blogger from London who has been traveling since October 2011 with her Australian partner and too many vintage clothes. She documents her life and travels as a “digital nomad” on her blog As the Bird flies. 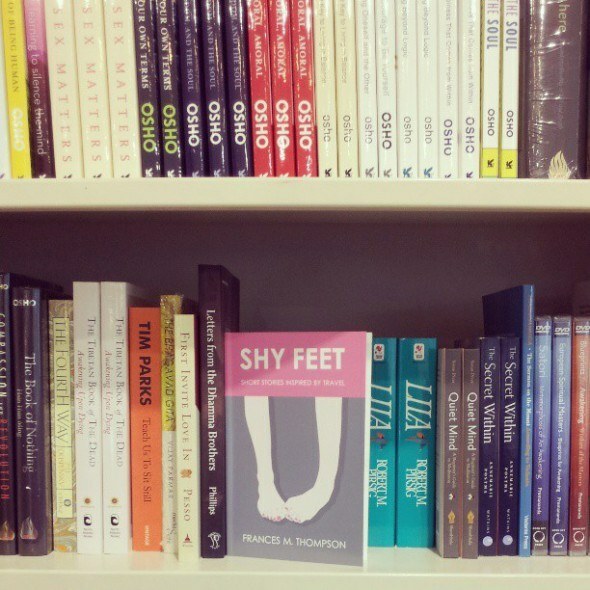 In August 2013, Frankie published her first collection of short stories; Shy Feet: Short Stories Inspired by Travel , it is a collection of quirky and contemporary fictional tales. Currently based in Amsterdam, you can find Frankie capturing daily moments of happiness on Instagram as @bushbirdie.